.1 For refereeing in the tournament each forum-participant has the right to put an representative in the Judiciary board. 4.2 Voting of members of a Judiciary board appoints the Main Referee. 4.3 Main Referee carries out the general refereeing of tournament and makes decisions on all questions, dealing with all contentious issues and regulations infringements. 4.4 Main Referee appoints his Deputy and assistants to the Main Referee and distributes duties among them. 4.5 Judiciary board gathers in cases demanding a joint decision – upon request of the Main Referee. 4.6 Judiciary board makes decisions by voting. Judiciary board decisions are definitive. 4.7. Team captains put all contentious issues of the tournament course for consideration to the Judiciary board. 5. THE PURPOSES AND PROBLEMS. 5.8 Broaden friendly relations between countries and regions. 6. TIME AND THE PLACE OF CARRYING OUT OF TOURNAMENT. 6.1 Tournament begins on Thursday, on September, 18th, 2014 at 21-00 Moscow time(19-00 Oslo, Warsaw, 20-00 Riga, Vilnius, Helsinki, Tallinn, Minsk, Kiev), and lasts 13 weeks. 6.3 Teams meet on ice 2 times a week. 6.4 Game days – Monday and Thursday. 6.6 Start of the first game in round – 21:00 Moscow time. 6.7 After the agreement of both teams (for example, in case of an unstable server), all games may be carried out on one server. 6.7.1 In case of suspicion of the stability of a host, guest team captain may request from the host team a test game of a 10-minute session. When conditions for guest players on a given host are unstable, the home team must provide another host. Otherwise, the game is moved to the host of the opposing team. After starting the session (command "GO!" by Captains), the game is considered to be effective and not subject to a replay, except for a mass departure of players from both teams (40%) Failure to follow these rules (leaving the host, etc.) leads to a technical defeat of the team in the game. 6.8 In case of impossibility of carrying out any of games between two teams on official game day, they (after captains agreement) have the right to postpone the game. Captains must inform the Main Referee on it in corresponding theme or captains chat in Skype. 6.9 In case of impossibility of carrying out any of games between two teams in official game time, they (after captains agreement) have the right to delay the game start, but no more, than 30 minutes. 6.10 In case of disagreement of one of teams about carrying out the game (postpone, delay), game should be played in agreed time. Captains must inform the Main Referee about the case in corresponding theme 2 hours before the beginning of game. 6.11 Captains chat was created in Skype for quick communications between captains and referees and assistant to settle disputes. 7.0.1 Tournament consists of 2 rounds. The first round is qualification, the second one is final. 32 entries were applied.In the case if there be more entries tournament reglament will be changed. All teams are divided into 4 groups each of 8 teams. Distribution depends on the results of the European Team Championship 2014/2015. The first 4 teams take the first positions in its groups; the second 4 teams which took 5-8 places take the second lines .then the groups from 9-12 etc 16 th.. New teams are distributed in subgroups according to the draw (in the 10 min session, representatives of the teams on Linlonlahti). Each team play with each other from its group once. Each team can play 1 location once. Repeating locations and game types is forbidden. Types of game like ONLY zander.only pike is not allowed to choose. Teams which will take 1-6 places go to the final round. 24 teams will play in final. Final round is round robin. Each team play with each other 1 location once. The results of the preliminary stage between finalist teams included one subgroup in the final round. (Locations ordered in qualification kept in mind, an order location repeatedly is forbidden.) In all 18 tours (3 x 30-minute games with each other). The first game task of referees is announced before beginning of the tournament, the second game – is ordered by host, the third – by guests . Teams must NOT order the same game as the task of arbitrators in current round (both locations and conditions). It is forbidden to repeat locations and game types of task from arbitrators in current tour. In such cases teams will be punished by defeat 2-0 in this game (41-0 in scores). Each team play with each other once. Each team can play 1 location only once. Forbidden repeat locations and game. Shall be punished by technical foul. 7.1.1 To participate in the Tournament are allowed teams which have made an application prior to the beginning of Tournament. Applications have to been made till 10th of september 2014. 7.2 A team representative is its captain, or his deputy. 7.3 It is necessary for Captains of teams to be registered at all forums – participants of tournament. It is necessary for operative information interchange with the captain of opponents . 7.4 It is Captains or their deputies duty to provide lists with names of players of the team till September, 16th. 7.5 Maximum number of players on that list is 16 (10 basic players + 6 subs), only from among officially registered participants of a "home" forum who play the whole tournament from beginning till end. If a team loses in the course of Tournament three, four, or five players from the 16 registered players , it has to finish the Tournament with its 13, 12, or 11 players. 7.6 In case of the primary demand of smaller quantity of players, the team has the right of them add to 16 during tournament in the subsequent from among players registered on a forum prior to the beginning of tournament. 7.7 Captain can put into the game any from the declared players. 7.8 Team independently chooses any of 10 players who will play on game day. If an undeclared player appears on a game standing list, it is resulted with that team defeat in the game. 7.9 If a player who has already played in the tournament for one team appears in another team, it results in another team defeat [technical foul] . 7.13 All players of a team should wear the same uniform color. 7.14 A nickname of a player, a team name are presented in a required form. 8. RULES OF CARRYING OUT THE TOURNAMENT. 8.0 Tournament consists of 2 rounds. The first round is qualification, the second – final. 8.1 Tournament is round robin. Each team plays with each other from its group once. 8.2 A round consists of three games 30 minutes each. 8.5 Games begin on servers of teams listed first in steams. A home team provides opponents with IP by email, chat, Skype or any other mean 30.min before game have to start. 8.6 Location and game type must be declared at least 1 minute before the game starts. 8.7 Every team has NOT the right to order 1 location twice. This should be punished and resulted in technical foul. 8.9 A team line-up in a game is no more than 10 players.If you exceed the number of players on the team in the game, the team may be punished by a technical foul. One of the players on the team can be a hosting company, in excess of the composition of the game. In this case the player should not leave the area started. 8.9.1 Team can run the game if there is 4(not lees) or more players at the game.if any players leavs the game than the team will be resulted as a technical foul. 8.10.1 In case of mistaken start of the location which is not as planned by home team, restart without agreement of an away team in not allowed, and must be played at the started location. Not agreed restart is punished by technical foul. 8.10.2 In case of mistaken start due to game conditions which cannot be used because of the inadmissibility under tournament regulations, a home team has the right to make restart. 8.10.3 If in case of mistaken start due to game conditions which cannot be used because of the inadmissibility under tournament regulations, a home team will not restart the game within 2.min after start, the game should be played till the end. A team breaking the rule is punished with technical foul. Points are awarded according to standings. 8.10.4 Prohibits the use of functions / results . 8.10.5 Function / autoban. at the beginning of the game is automatically installed and hosting company hosting provider is obliged to 5 minutes prior to the start notify all participants of the function is enabled. It was only with the mutual consent of the captains (deputies) can be disabled team / autoban. 8.11.1 Unreasonable writing in public chat is not recommended. No abuse in private chat. 8.11.2 Obscene expressions in a chat can be punished by suspending on one or several games, including disqualification till the end of tournament. 8.12 Being late and absence in games. 8.12.1 Being late means an occurrence of the player or all team on a game server after established time of the beginning of game (with declared IP). 8.12.2 Absence is a failure to show up of a player or a team on a server during the game time on the given location (with declared IP). 8.12.3 Absence in a game without any agreement about moving a game for another time is the rules violation and is punished by technical defeat. 8.12.4 Being late or absence of a whole team on game due to lack of server IP or technical impossibility to enter the are not the rules violation and are considered by the Referee separately. As a rule, in this case the Referee sets a replay in time agreed by 2 teams. 8.12.5 In case of absence of a whole team an the appointed time without earlier notice – with the IP given to the opponent, - Home captain is obliged to send a message in a corresponding theme of an official site of tournament and to try to contact the captain of the contender in a chat or other available way. 8.12.6 In case of absence of a whole team an the appointed time without earlier notice –, - Home captain should start the game. Further, if players of an away team arrive at a game, the game should proceed in an usual mode. Otherwise, an away team could be awarded technical defeat. Points for the taken places in this case are not given. 8.12.7 In case of being late of one or more players for a game start, the away captain can ask the home captain to delay the start (up to 10 minutes) time. In case of longer delay or refusal of the Home captain to delay the start, game begins at available numbers of away players. 8.12.8 Late players can enter game at any time, without the prior notification to the opponent. 8.13 Distance between players on ice of different teams is regulated by the game. Drilling some holes by player(s) near opponent player(s) in short time (90 seconds) is a violation. It shall be punished by prevention to player (players, team) up to disqualification. (The infringement s?reen(s) is(are) obligatory.) Statements in a game chat on a theme «drilling» are forbidden. In that case a captain should address a claim towards the other captain to stop it. At no response a captain can inform the referees about the case. 8.15 Big fish in this tournament is not taken into account, a player having Big Fish caught is not awarded any point. 8.16 A result of a game is determined by a score of the first 12 positions in the total table. If some players take the same place, points are scored according to taken places. For example, 3 players take 5 place, each player receive 8 points. The winner is the team whose players have scored more points in total. 8.17 For a victory a team receives 2 points, for a draw - 1 point, for defeat - 0 points. 8.18 Host team Captain or a team nominee sends results to captain team chat in skype and publishes results of a meeting at home forum on captain demand. 8.19 Results of games published in the appropriate forum threads, tournament organizers in the form of a play-log, which indicates the location and conditions of the game and the place occupied by the players, as well as the overall outcome of the game. 8.20 Results have to published 60.min after game finishes,if the results wont be published by the time the team could result in technical defeat. 8.21 Points scored by a team are summarized and shown in standing Scoreboard. The winner will be recognized by most points scored. 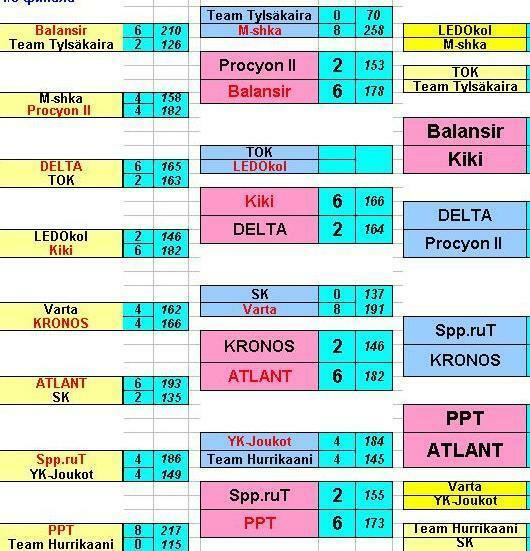 8.23 Results of games after each round, the table of the locations ordered by teams and the intermediate table of tournament will be periodically published in a theme (http://www.kalassa.n...elut/index.php? topic=21013.0) - in the form of total result of a meeting between teams, and in forums–providers of tournament. 8.24 Claims against opponent team concerning a last game should be presented to the Judiciary board within 12 hours after the game. Processing time is 2 days. 8.25 Referees of tournament gather results of a round and spread them at an official forum for convenience of further calculation. 8.27 At occurrence of disputable situations the full screen of a meeting and a playlog is published. 8.28 In case of new version release – we will finish tournament in the new version of game according to new agreed regulations. New lakes and types of games if they appear - in this tournament must not be played. 8.30 In case of elimination or withdrawal any team before the end of tournament points, scores and chosen locations will be cancelled. 9.1.3 Suspension till the end of tournament. 9.2.1 Malicious infringement of regulations and tournament rules. 9.2.2 Open disobedience to fulfill requirements of the Referee in a game chat or in corresponding themes of forums. 9.2.3 If the player is not identified with a team (the screenshot and play log does not display an accessory to a team) his result is counted. For the best results please have a look at the changes in the rules. 8.8 Types of games All species and Normal on one location are considered as one game type,except ONLY ZANDER and ONLY PIKE-can results in technical fool. 8.13 Distance between players on ice of different teams is regulated by the game. Drilling some holes by player(s) near opponent player(s) in short time (90 seconds) is a violation. Addition to the Rules ! "In case of suspicion in the stability of the host, the captains of the visiting team may request from the host command test run 10-min session. When an unstable connection players on this host, the home team shall provide the other host. Otherwise the game is transferred to the host of the opposing team or neutral backup host at the appointed arbitrator . Failure to comply with these rules (demarche from the host, etc.) entails technical team defeat in the game." "In the case of a report of the game on the mismatch catch (Client fish count mismatch ), the result of the player will be cancelled. The player has the right to appeal against the verdict (for 12 hours after the game) . Base for decision-making leading arbiter of the tournament - Playlogic player and host + file records the player." Please kindly to the team captains and players about the SAME writing team name !!! - expansion of friendly ties between forums, countries and regions. Terms and Conditions of the tournament. To participate in the tournament national teams (one per country) are allowed, have submitted a request to the organizers before the start of the tournament. Application is published in this topic. The application form is free. Captain can field on the game any player declared. Qualification is a circular system of games between the teams in the subgroups. Each round in qualification consists of three consecutive games. 3*30 minutes on a single server of the home team. The teams - no more than 12 players. Tactical substitution allowed during the break between sessions. Game types for all qualification tours are the same for all teams and will be exhibited by arbitrator before the tournament. The main game day event - Thursday. If one of the teams taken part in a match, can not play (for whatever reason) on this day, you must publish the request to postpone the game in the topic no later than Tuesday. Games must be played within 6 (six) calendar days after the announcement of tour started. Host teams pay attention to the binding sequence of tasks in each round, because "guest" team may plan tactical substitutions for each game. Captains of the guests have to control as the conditions and compliance with the tasks. Way to resolve possible errors - restart. The winner is determined for each game. For the victory in game - 2 points, for a draw - 1 point, for a loss - 0 points. Points are awarded as follows: 14-12-10-9-8-7-6-5-4-3-2-1 for places 1 to 12, big fish – 1 point. The winner is determined by the highest number of points (as in qualification and in the playoffs). In the playoff tours teams play 4 games of 30 minutes which are carried out on two servers ("host" and "guests"; 2 tasks from each team). Accordingly, each team puts their tasks in the game chat before the game. The team has no right to order the same location 2 times. There is limitation of the game type - no more than one special assignment (biggest fish, only perch, quantity, etc.) from the team in tour. Controversial problems, infringements of the rules, etc., arising during the tournament and are not displayed in this Rules will be solved according to the rules of the League of Europe. Depending on the number of applications will be made the toss of the coin to divide into subgroups and compiled a calendar of games. Deadline for applications – December, 23 2014 at 24.00 MSK (22-00 Oslo, Riga, Vilnius, Helsinki, Tallinn, Minsk, Kiev). Russia (2), Ukraine (2), Finland, Belarus, Norway, Poland (3), Estonia, Latvia, Lithuania, Sweden, Kazakhstan and other national team sent an application in tournament in time. Team "Dream Team" will be established after the deadline for applications from the national teams and will consist of players from different countries, which were not chosen as part of their national teams. 6.1 Tournament begins on Thursday, on September, 17th, 2015 at 21-00 Moscow time(19-00 Oslo, Warsaw, 20-00 Riga, Vilnius, Helsinki, Tallinn, Minsk, Kiev), and lasts 13 weeks. All teams are divided into 4 groups each of 8 teams. Distribution depends on the results of the European Team Championship 2015/2016. The first 4 teams take the first positions in its groups; the second 4 teams which took 5-8 places take the second lines .then the groups from 9-12 etc 16 th.. New teams are distributed in subgroups according to the draw (in the 10 min session, representatives of the teams on Linlonlahti). 7.1.1 To participate in the Tournament are allowed teams which have made an application prior to the beginning of Tournament. Applications have to been made till 10th of september 2015. 7.4 It is Captains or their deputies duty to provide lists with names of players of the team till September, 15th. 6.1 Tournament begins on Thursday, on September, 19th, 2016 at 21-00 Moscow time(19-00 Oslo, Warsaw, 20-00 Riga, Vilnius, Helsinki, Tallinn, Minsk, Kiev), and lasts 13 weeks. 7.1.1 To participate in the Tournament are allowed teams which have made an application prior to the beginning of Tournament. Applications have to been made till 15th of september 2016. 6.1 Tournament begins on Thursday, on September, 18th, 2017 at 21-00 Moscow time(19-00 Oslo, Warsaw, 20-00 Riga, Vilnius, Helsinki, Tallinn, Minsk, Kiev), and lasts 13 weeks. All teams are divided into 4 groups each of 8 teams. Distribution depends on the results of the European Team Championship 2016. 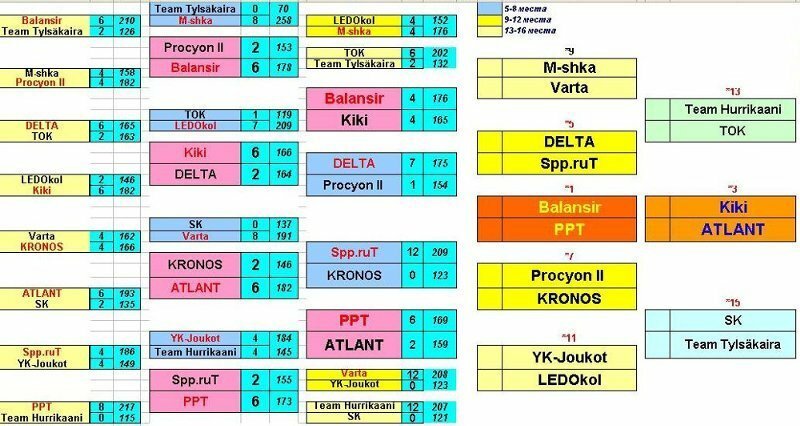 The first 4 teams take the first positions in its groups; the second 4 teams which took 5-8 places take the second lines .then the groups from 9-12 etc 16 th.. New teams are distributed in subgroups according to the draw (in the 10 min session, representatives of the teams on Linlonlahti). All teams are divided into 4 groups each of 7+7+7+8 teams. Teams which will take 1-5 places go to the final round. 20 teams will play in final. Each round in qualification consists of three consecutive games. 3*30 minutes on a single server of the home team. The teams - no more than 10 players. Tactical substitution allowed during the break between sessions. Depending on the number of applications will be made the toss of the coin to divide into subgroups and compiled a calendar of games. Deadline for applications – December, 11 2017 at 24.00 MSK (22-00 Oslo, Riga, Vilnius, Helsinki, Tallinn, Minsk, Kiev). Russia (3), Ukraine (3), Finland (2), Belarus, Norway, Poland (3), Estonia, Latvia (2), Lithuania, Sweden, Kazakhstan, Moldowa and other national team sent an application in tournament in time. European Team Championship 2017 , results. 1 - [Ukraine-1] Cousen - 152 !!! 2 – [Ukraine-1] Raven – 150!! 3 – [Polska] beret - 147 punktów ! 6.1 Tournament begins on Thursday, on September, 20th, 2018 at 21-00 Moscow time(19-00 Oslo, Warsaw, 20-00 Riga, Vilnius, Helsinki, Tallinn, Minsk, Kiev), and lasts 13 weeks. All teams are divided into 4 groups each of 8 teams. Distribution depends on the results of the European Team Championship 2017. The first 4 teams take the first positions in its groups; the second 4 teams which took 5-8 places take the second lines .then the groups from 9-12 etc 16 th.. New teams are distributed in subgroups according to the draw (in the 10 min session, representatives of the teams on Linlonlahti). European Team Championship 2018, results. Russia (2), Ukraine (3), Finland (2), Belarus, Norway, Poland (3), Estonia, Latvia (3), Lithuania, Sweden, Kazakhstan, Moldowa and other national team sent an application in tournament in time. I was thinking about organizing a Championship among the best European teams. Yes, Team Championship, Europe Cup have a decent status, but I would like to invite teams from PP2 SM-liigi. The Championship is quick and will lastt for 4 days. Your idea sounds fair enough..
and if possible, which lakes would we play ? The teams - no more than 8 players.